I stayed home sick today, and thought I’d watch a movie on the couch tonight–take things easy. Right around midnight, just as my movie was ending, I heard a loud boom and saw a flash outside my window. At first, I thought fireworks were going off on the street. Then I realized that made no sense. When I ran to the window and saw another flash and the street clouded with smoke, I thought the building on the corner was on fire. As soon as I opened the front door, I smelled gas, and saw two firetrucks parked in front of the building. My next thought was that it must be a gas line, like what recently happened outside of San Francisco. Getting closer to the action, I realized that wasn’t it at all. 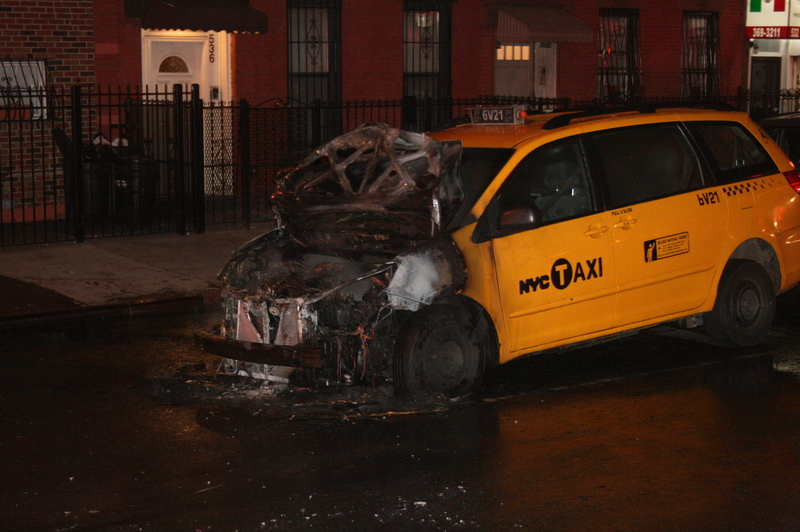 It was a cab with the front blown to bits. When I first got down there, it was still smoking. Firefighters had surrounded it and were spraying it down. The front and passenger doors were both open, and someone told me the driver had run off. By the time I returned with my camera, the firefighters had finished ripping apart the front of the car. I don’t know what they found, but I was relieved not to see any bomb squad appear.